After the Turkish riots in Rotterdam, caused by denial of the Dutch authorities to honor Turkish diaspora request for a rally in support of the President Erdogan, the relations between The Netherlands and Turkey continued to degenerate. Today the Dutch flag was removed from the General Consulate building by protestors in Istanbul, and replaced by the Turkish one with the Islam symbol of half-moon. A man, conducting the replacement loudly shouted “Allah Akbar!” (Video below). 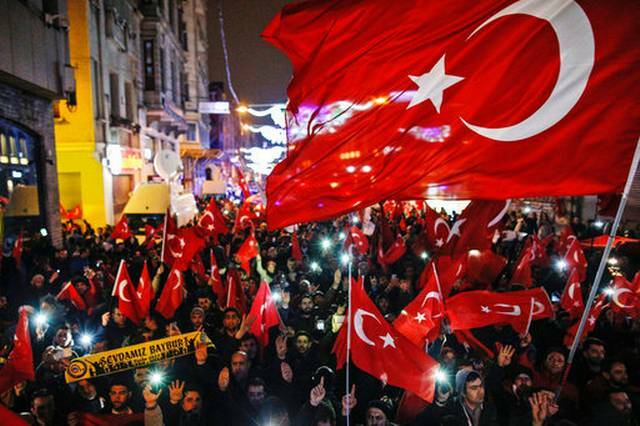 The hypocrisy of the Turkish authorities organizing the rally in support of Erdogan in Rotterdam startled many: the numbers of jailed victims of regime actively circulated in social media: 153 journalists, 13 elected MPs, 80 elected mayors, countless activists remain jailed in Turkey.